Criminal Psychologist Jonathan Crane reinvented himself as Scarecrow, the living embodiment of terror. With his own feelings of fear numbed, Scarecrow was a lost soul when the Blackest Night descended upon the world. But after being chosen by a Sinestro Corps Ring to battle the Black Lanterns, Scarecrow channeled pure, unbridled fear through his Yellow Ring in ways that exceeded his wildest dreams and nightmares. Scarecrow gets an all-new sculpt, which makes him a real standout in Series 17. 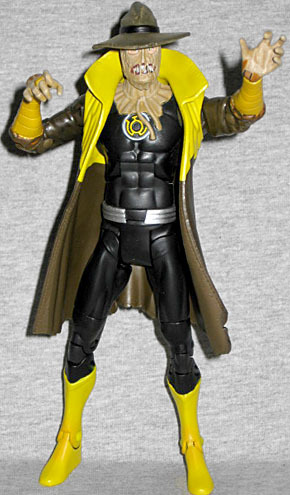 His costume is mostly accurate to the comics, so he's wearing his tattered coat above his uniform - the arms have the wrinkled sleeves and the usual Sinestro Corps bracers. The yellow pattern on his coat is sculpted as a raised element, complete with stitches holding it to the rest of the fabric. The Sinestro Corps logo on his chest is fully sculpted, rather than painted - an odd choice. 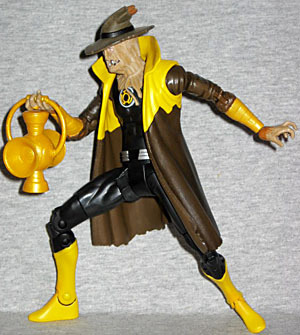 Rather than black pants and shoes, like the comicbook and the DC Direct figure had, he's got tall yellow boots. No, it's not accurate, but figure Mattel is planning to reuse these legs later. His ring is sculpted, rather than being a random drop of paint, but it's on the wrong hand: the comics clearly showed it on his left hand, not his right. The paint is very good. Of course, it helps that so many of the breaks in color coincide with edges in the sculpt, but that's never a guarantee of quality. The silver circles on his gold bracers overflow their edges a little, but not to the extent that they look sloppy. If you peer up under the brim of his hat, you'll find his irises have gone yellow - a small detail that would have been very easy to skip. The exposed skin around his mask's eyeholes isn't the inexplicable burnt umber the DCD figure's was. Scarecrow is also the highlight of this series when it comes to articulation. He has hinged ankles, double-hinged knees, swivel thighs, H-crotch, swivel waist, hinged torso, swivel/hinge wrists, double-hinged elbows, swivel biceps, swivel/hinge shoulders, and a balljointed head. The knee joints are a little stiff, but they moved without breaking. So how is it Mattel can afford this new tooling on pieces that have very little re-use potential (the arms), but the plain arms that will go on every figure from now until doomsday can't get updated to modern standards? The figure includes a Yellow Lantern battery (which he shouldn't), but it's not the actual yellow battery as seen with Sinestro - it's just a yellow version of a Green lantern. The DCUC Series 17 build-a-figure is the Anti-Monitor, and Scarecrow comes with the right leg. It's a big piece, with a fine sculpt, but the silver of the thigh doesn't match the grey of the upper hip. Maybe it will be covered by a large belt or something, and not as obvious on the assembled figure. We're reviewing DCUC17 here on the blog because the entire series duplicates figures that have already been made by DC Direct, and we've already talked (at length) about the characters, so these reviews are all about comparing the two companies' products. For Sinestro Corps Scarecrow, Mattel's has (much) better articulation, DCD's is (slightly) more comic-accurate, so in this case, it depends what you want from the figure. This entry was posted in blog exclusive review, DC, Four Horsemen, Mattel and tagged Batman, DCUC, Green Lantern. Bookmark the permalink. One of the few times we've actually had a logo sculpted onto a character's chest. They should all have this. I repeat, THEY SHOULD ALL HAVE THIS. I'm buying the HELL out of this figure for the Anti-Monitor piece. Even if the BAF is tiny and disappointing as hell, it's still the damn Anti-Monitor. Is it just the flash making the yellow seem so vibrant on yours? Mine is rather drab, especially next to his other Corps mates on my shelf. I know yellow is a hard color to paint, but Mattel's been all over the place on the Sinestro Corps figures, they just can't nail a standard yellow shade. It must be: his yellow is even paler than Sinestro Batman, who was himself paler than most of the other Sinestro Corps members. Compare his coat and boots to his battery. I really hope this isn't true--poor Golden Age Hawkman's gonna develop a complex. Whether it happens or not I can't say, but I'm guessing that was the intent. If anything, if they don't make it out, there's a huge chunk of our subscription right there! Also, yup, I predict these legs to be used on the DCUC20 Sinestro. Despite my initial dislike of the boots, I actually wouldn't mind picking this up since it looks like a fun figure to have. That seems very unlikely: I just checked eBay, and not a single figure on there has a Sinestro battery. Granted, it's possible that's a running change that no one's put online yet, but since, at the very least, the tray would have to be remolded to accommodate the different Lantern, the odds are more in favor of you being mistaken. You should check the ones in the store more carefully. But heck, if we're wrong, take a picture of the battery and we'll add it and the info to this review! quick question, i dont know whether to get this version or the DC Direct one, do you reccomend one over the other? I would get this one because, in my opinion, the sculpt is just as good, if not better, than DC Direct's version. He also comes with a piece of anti-monitor.